Sheila Downie from Scotmid's North Regional Committee with the new bumblebee board. 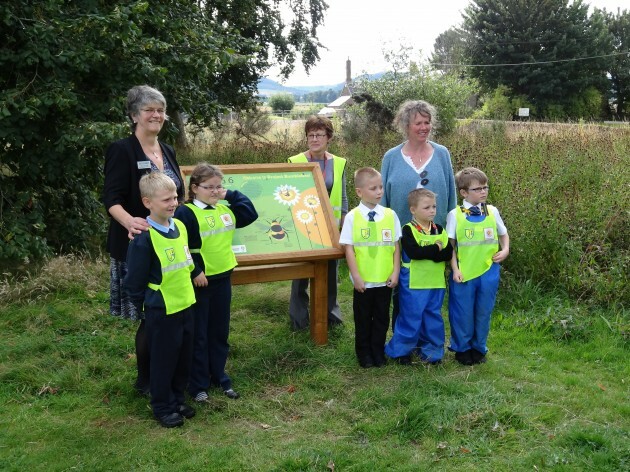 Scotmid has helped fund a new educational initiative about bumblebees in a local park in Coupar Angus, Perth and Kinross. The ‘bumblebee interpretation board’ will provide the local community with information on bumblebees and their importance in society. It is also designed to encourage park visitors to explore an area designated for biodiversity. The bumblebee board has been installed by the Coupar Angus Pride of Place community group, which aims to restore civic pride in the town through environmental awareness campaigns. The group has also created a wildflower garden in the park to attract more bumblebees to the area. Bumblebees have been experiencing a dramatic decline because of changes to the countryside and agricultural techniques in the UK, which remove flowers from the landscape and leave the bumblebees with less to feed on. The bumblebee project has helped Coupar Angus Pride of Place win a nomination for this year’s Britain in Bloom award. Scotmid’s community grant scheme aims to support local communities served by its stores, by awarding grants to community groups and charities who make a positive contribution to the environment, health, Fairtrade, homelessness, poverty, the arts and culture, children and education, elderly people and active lifestyles.